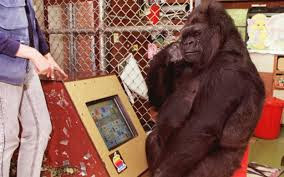 Koko, the gorilla that learned sign language and formed several celebrity friendships while in captivity in the US, has died aged 46. The female western lowland gorilla, which gained fame for its mastery of “gorilla sign language”, died peacefully in its sleep at the Gorilla Foundation’s preserve in California, the foundation said. Originally named Hanabi-ko – Japanese for “fireworks child” – after being born at San Francisco Zoo in 1971, Koko learned a rudimentary sign language through a researcher, Dr Francine Patterson. Koko reportedly understood around 2,000 words of verbal English.